Part of reading a new novelist is the joy of learning how they write. Their pacing, their characters, their voice… all new and exciting. 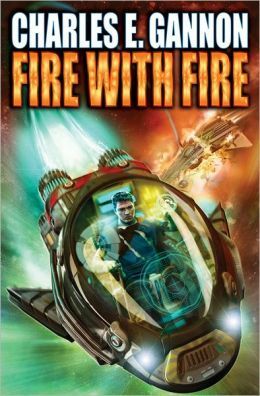 While Chuck Gannon isn’t entirely “new” for me (I’ve read his 1632 stories), this is his first solo novel I’ve read and I was quite pleased with the end product, Fire with Fire a science fiction novel that has a lot of everything in it — intrigue, suspense, action, mystery, and even a little bit of romance. Without a doubt it’s one of the best SF books I’ve read this year. Caine Riordan wakes up out of cold sleep and missing memories from the past 100 hours. He is disoriented and confused, since cold sleep (cryogenic freezing) was not something one usually lost that many memories to. He learns that he has not been asleep for 100 hours but, instead, for over 13 years. He struggles to answer questions and to find out what had happened, how it happened, and what would drive them to keep him asleep for so long. However, answers aren’t entirely forthcoming from those asking him questions, and he soon realizes that the man asking him questions, Richard Downing, has a hidden agenda. The man also wants to give him a job. Recruited into a world of intrigue, Caine must figure out what is going on at a small island known only as Shangri-La on a planet humans have settled far out in the galaxy. Initially thinking that it is simply an oil operation by a major corporation, he soon discovers that something far deeper and darker is at play as he stumbles upon the remnants of a lost alien culture living, and sentient aliens living on the planet. Armed with this information, Caine must make it back to Downing and his allies before the assassins of the oil corporation can stop him. The only downside of this book is that it really is two books in one, which means that reviewing this without spoilers is very difficult. Caine must survive long enough to make a presentation to a group of power brokers on Earth at the Pantheon in Greece, and again survive assassination attempts in order to let the politicians on Earth know that humans are not alone. A world government is being formed, and the news of alien existence could make or break the proceedings. And then the book really gets going as aliens themselves initiate First Contact, and request that none other than Caine Riordan be on the first contact team. Gannon’s plotting and pacing is fabulous, and Caine is a believable character you can’t help but to root for. His bodyguard/companion/potential love interest, Opal Patrone, is a solid support character with her own tragic past and, due to cold sleep, a woman out of her time. The empathy one feels when she struggles to adapt and, after she does, going about her business with a strange mixture of relentlessness and trepidation is nerve-wracking. The author keeps the action and story barreling forward with only one inevitable conclusion at the end. Gannon has himself a winner here. Fire With Fire is a tremendous first effort and promises so much more in the following sequels. This is a must-buy for fans who love a good SF story. This entry was posted on April 23, 2013, 8:07 pm and is filed under Book Review. You can follow any responses to this entry through RSS 2.0. You can leave a response, or trackback from your own site.